202 pages | 7 B/W Illus. This book takes a fresh look at secondary urban English classrooms and at what happens when students and their teachers explore literature collaboratively. By closely examining what happens in English lessons, minute by minute, it reveals how literary texts function not as a valorised heritage to be transmitted, but as a resource for the students’ work of cultural production and contestation. The reading that is undertaken in classrooms has tended to be construed as either a poor substitute or merely a preparation for other reading, particularly for that paradigmatic literacy event, the absorbed and simultaneously discriminating consumption of the literary text by the independent, private reader. This book argues for a different understanding of what constitutes reading, an understanding that is informed by historical and ethnographic perspectives and by psychological and semiotic theory. It presents the case for a conception of reading as an active, collaborative process of meaning-making and for a fully social model of learning. Drawing extensively on data gathered through classroom observation and filming of English lessons taught over the course of a year by two teachers in a London secondary school, the book explores students’ engagement with literary texts and the pedagogy that facilitates this engagement. The book offers new insights into reading, and reading literature in particular. It challenges the paradigm of reading that is offered in government policy and the assumption, common to much work within the field of ‘new literacies’, that ‘schooled literacy’ is the already-known, the default, against which the alternative literacy practices of homes and communities can be defined. It will be valuable reading for researchers, teachers, teacher educators and postgraduate students, and will have particular appeal for those with an interest in the fields of English studies and literacy. 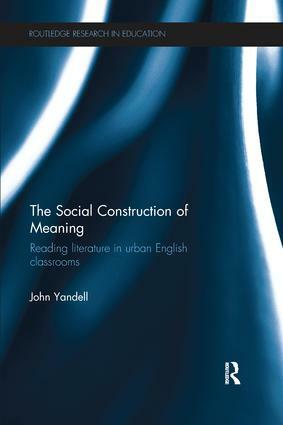 John Yandell taught in inner London secondary schools for twenty years before moving to the Institute of Education, University of London, UK. He is the editor of Changing English: Studies in Culture and Education.